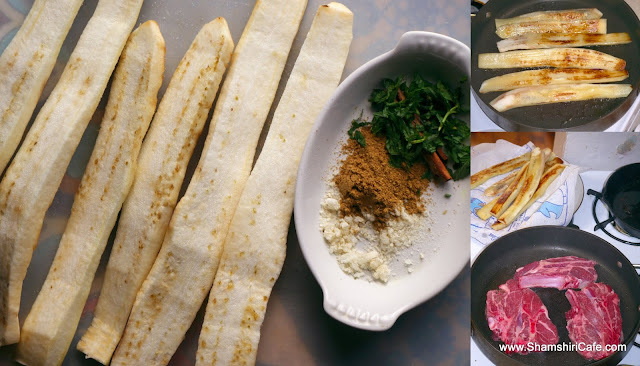 In the previous post, I reconstructed a recipe from "A Baghdad Cookery book" which is a collection of ninth century recipes from the court of Islamic caliphs. The book depicts a magnificent cuisine, believed by historians to have been directly imported from both the court of Sassanian Empire kings and the dining banquettes of elite castes of the highly aristocratic Persian society. The previously presented recipe was focused on Sikbaj, an ancient sweet and sour version of the modern-day Persian eggplant stew and was made with grape juice and vinegar. 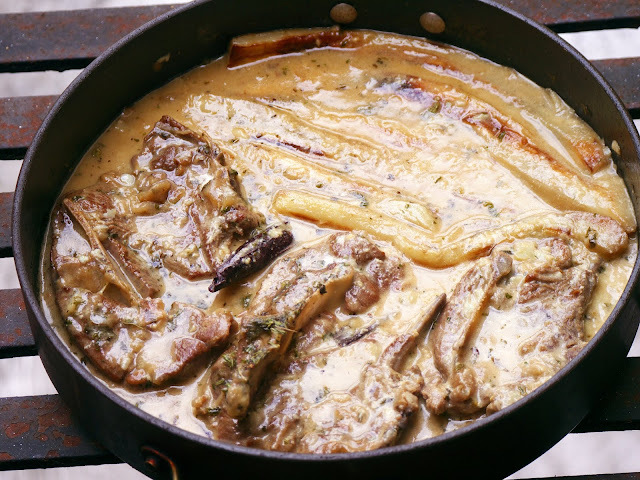 To show the level of gastronomic sophistication at the medieval Persian cookery, here I present a similar eggplant stew with an entirely different flavor profile. Called "Labaniyya," the stew is flavored with Persian yogurt, mint, and mastic. While both Sikbaj and Labaniyya are from the first chapter of the book (i.e. sour dishes), the latter belongs to the second part of the chapter (i.e. 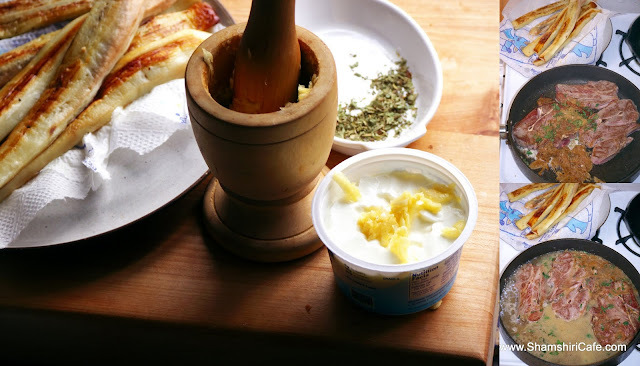 Yogurt and things to cook with it). Peel the skin of eggplants, cut them in half, and heavily salt. Wait for 10~15 minutes or until several drops of drained water appear on their surface. Wash and pat dry. Pour the oil in a large skillet (which has a lid), set on high heat. Fry the eggplants until soft, with both sides of each slice golden brown. Remove the eggplants from the pan and transfer them to a plate which is lined with paper towel. Brown the meat in the same pan (which hopefully should require no more added oil). Although eggplants quickly absorb most of the oil in the frying pan, during the waiting period on the plate most of the oil is absorbed by the lined paper towel. 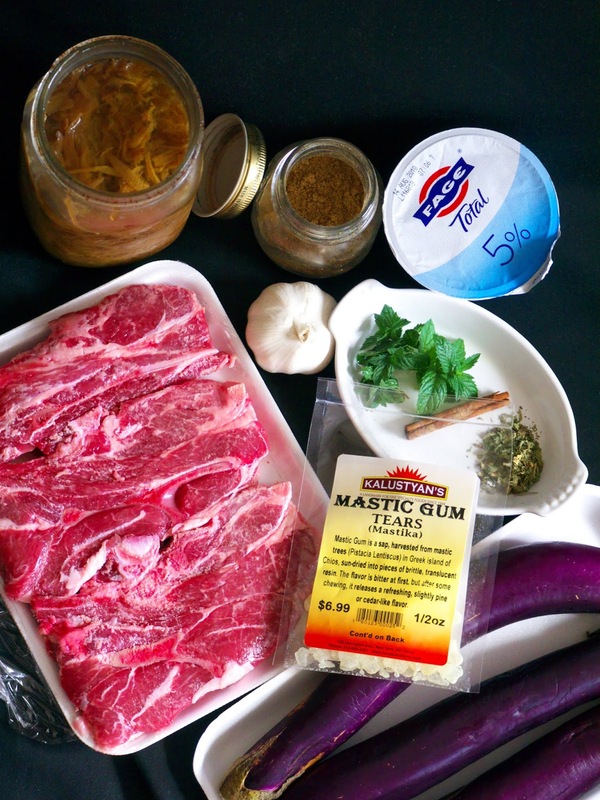 Note that absorbed oil by eggplant is the key to the magical rich and buttery texture of the eggplant in the Persian eggplant stew; boiling the eggplant in salted water, will not quite do the job. To the same pan add the cumin, coriander, freshly ground pepper, caramelized onions, and the finely chopped fresh mint and toast them for 30 seconds. Add enough water to barely cover and braise the meat. Decrease the heat to low, cover the pan, and let cook for 40 minutes or until the meat is fully cooked. In the meantime, crush the garlic clove and mix them with yogurt. Uncover the pan, arrange the fried eggplants slices on a side. Mix the yogurt mixture with a few spoons of the hot broth from the stew. This tempering technique will prevent the yogurt from congealing into lumps of protein and will result in a shiny sauce. The excessive fat on the surface may be skimmed with a spoon, in case a lighter sauce is preferred. Add the yogurt mixture to the stew and sprinkle the dried mint on the surface. 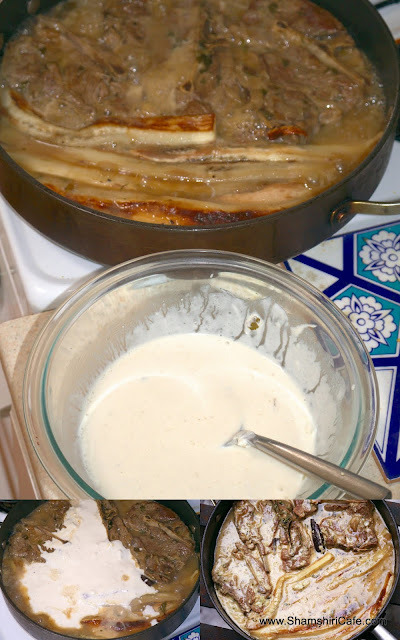 Increase the heat to medium-low, and cook for 5~10 minutes or until the sauce is very thick.